50 hour burn time Ganesh vigil! Dressed abd blessed for your needs! Ganesh is the Hindu God of money and wealth-he removes obstacles that stand int he way of you obtaining your dreams. Ganesh has the head of an elephant and elephants were the "bulldozers" of ancient times. Cultures that were fortunate enough to have elephants used them to built roads, cleared land and erected cities with their mighty power. Their trunks can lift trees but tip of their trunk is so sensitive it can pick a flower. Ganesh is the great remover of obstacles as well as the master of delicate issues. 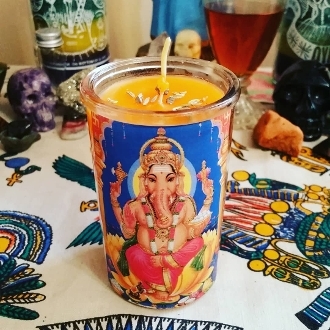 Use this oil to invoke Ganesh or use on a orange, white, green, or yellow candle. Chant Ganesh's mantra "Om Sri Ganesha yai Namah". Traditionally this is chanted 108 times. This mantra was chanted and Ganesh invoked with the preparation of this oil to bring you the best results! Add it to your liquid hand soap or liquid body wash to reinforce your obstacle clearing in everything you touch! This oil is also used with the God Mercury if using it in communication and success matters, such as getting a job. Created with coconut, honeysuckle, vanilla, and gardenia. With herbs of Cardamom, lemongrass, and tangerine zest. client feedback; "Amazing products as usual<3 Your Ganesh's Road Opener oil worked as soo fast. There was someone who was calling me all the time to tell me about the same drama over and over again. I already gave this person advice on how to effectively handle the situation. Once I put the Ganesh's Road Opener oil on an orange candle and lit the candle. Instantly the phone calls from this person ceased. This person also took my advice finally. I have not heard a dramatic story from this person after using this oil. Ganesh's Road Opener oil smells really good too. Her products are very effective. A reserved listing from Mama Sarah was so fast. Her shipping was fast. I love all of my goodies I purchased. Each item is made with lots of love. I have had success with every product I have purchased from her. She is very knowledgeable about her products. Friendly seller and wonderful customer service!"